Administering the dengue vaccines in the Philippines. Photo source. In a story that is being mostly censored in the U.S. media, vaccine manufacturer Sanofi Pasteur has admitted that their vaccine for dengue (a deadly tropical disease spread mostly by mosquitoes) is defective. 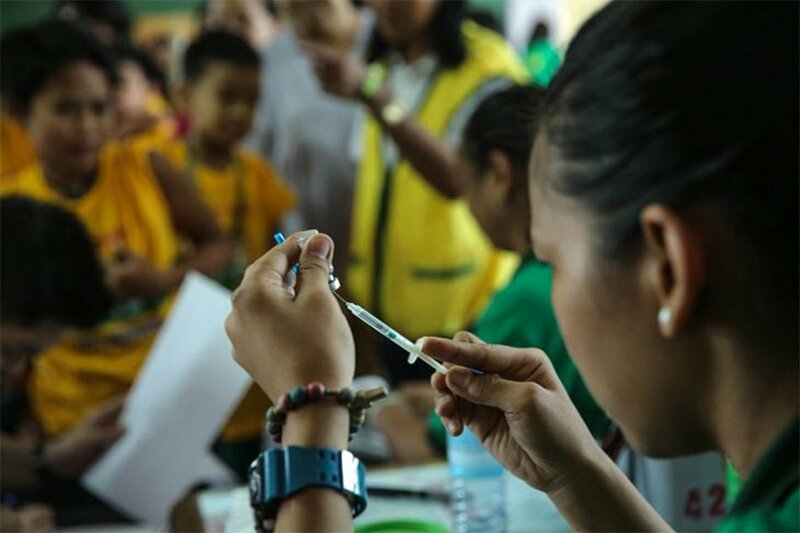 More than 730,000 Filipino children have received at least one dose of Dengvaxia, the first licensed vaccine for the virus, since the Philippine Department of Health launched the vaccination drive in schools last year. Newly appointed Philippine Health Secretary Fransisco Duque immediately instructed the Dengue Technical and Management Committee to meet with an expert panel to determine the next course of action. “The safety of the children vaccinated is paramount, and the Health Department will need to do surveillance of those given Dengvaxia with no prior infection. It’s really a big task,” Duque said. Sanofi Pasteur’s Wednesday statement was the first time the pharmaceutical company acknowledged that Dengvaxia should not be recommended to individuals if they have never been infected with the dengue virus. The manufacturer said it would ask health authorities to advise physicians and patients of the new information in countries where the drug has been approved. Dengvaxia is approved for marketing in 11 countries, mostly in Asia and Latin America, where dengue is a leading cause of serious illness and death among children.